The BGBOL, His Highness, Sir Occo, whatever people like to call him, returned home to Maud Island/Te Hoiere recently after conquering the mainland and capturing hearts and minds alike. 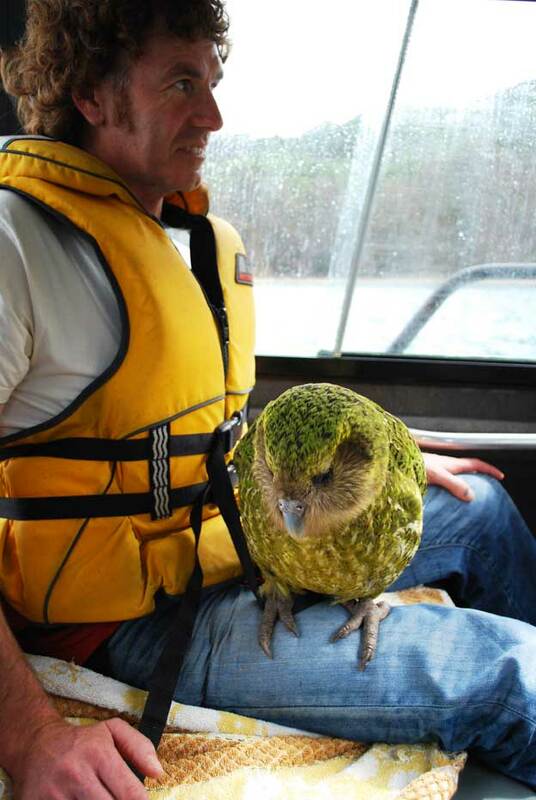 It was a reasonably bouncy boat journey back to Maud for Sirocco, the kākāpō conservation superstar, and his human passengers, so we decided that for his own comfort and safety it would be better if he were out of his transport box. 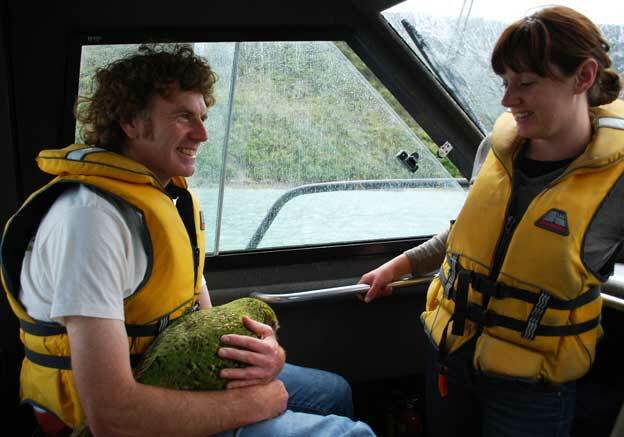 With the cabin door safely shut he spent most of the trip sitting on Kakapo Recovery Programme scientist Daryl Eason’s knee. He seemed to enjoy being able to see where he was going and having the sea air ruffle his feathers. Daryl on the other hand did not seem to enjoy Sirocco “stabilising” himself with his beak on the softer fleshy parts of his arm. He did look a little ‘green’ at some stages though, and was more than willing to get back in his box for the short walk to his pen on arrival at Maud. A pirate’s parrot he is not, it would seem. I think Sirocco enjoyed getting back to “nature” after so long in the spotlight. He won’t be free to roam just yet though. He has to go through a quarantine process to ensure he hasn’t brought any diseases back with him. 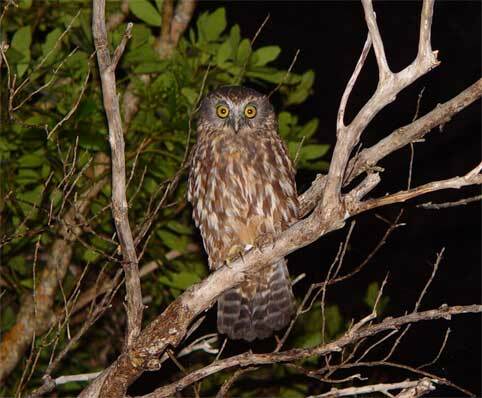 Although Sirocco is very important, there are also other species here to consider such as the takahe, orange-fronted parakeets, and the Maud Island frog. Once he receives a clear bill of health he will be allowed out of his quarantine enclosure. Don’t panic though, it’s not a cage. He has a large outdoor pen here to loll around in while he waits for the all clear. It’s a catered arrangement too, no macadamias or grapes though, sorry buddy. I’ll keep you posted on his progress and antics. 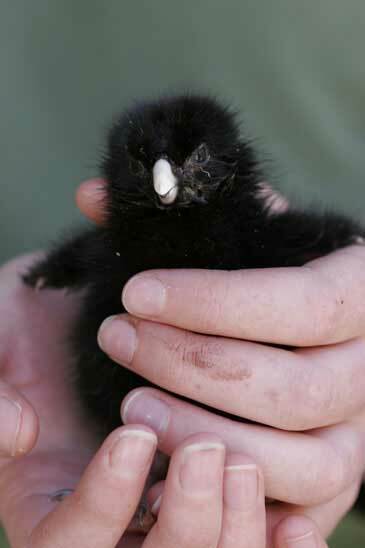 Another significant event here has been the hatching of our first takahe chicks. While it’s too early to count them as members of the overall takahe population just yet it’s looking promising. The first to hatch came on the day of the Rugby World Cup final. My partner Linda and I went up to the nest to check the egg for fertility and we discovered a small black chick in the nest, still moist from hatching. It was a great way to kick off a big day for New Zealand. We have unofficially christened it McCaw. Its dad is named “The Captain” so we thought that was appropriate. It’s fascinating to watch takahe parents in action, and The Captain and Rangi are great examples. Initially the parents were very protective of their chick. They kept it stashed away in the long grass and ferried bits of food to it, calling to it to tell it to lay low. As it got older and more mobile they have started to bring it out. We give them supplementary food – a mix of blended veges, clover and takahe pellets. The other day I watched them for 20 minutes. It was awesome to see how dedicated they are to their young chick. They have a keen sense of danger and will let the chick know if it isn’t safe to be out in the open, such as when the resident NZ falcon lets out its piercing call from high above. The parents turn their eyes to the sky and “whoomp” to send the chick scurrying for cover. Awesome! On a final note, spring has well and truly sprung here on Maud. The grass has really taken off and mowing the tracks has become an all too common occurrence! 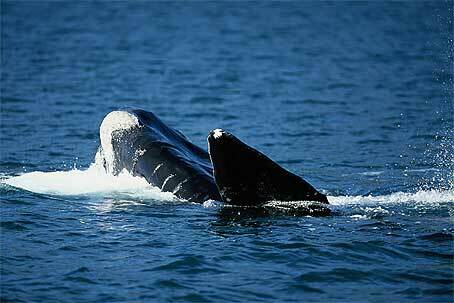 Other locals are breeding too. 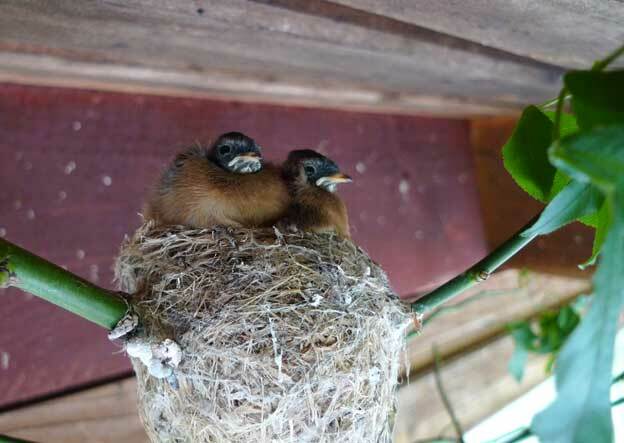 We have a fantail nest right outside our lounge; the parents have already fledged the first clutch of three chicks and appear to be considering a second! Underneath them, and below the deck, is a family of blue penguins. They aren’t the best flat mates, being quite smelly and prone to late night bursts of noise when mum and dad come home with a belly full of fish to regurgitate, but we don’t hold any of that against them. It’s still very cool to have nature literally on (or under) your doorstep. They will be gone soon enough and maybe we will miss them, but not their smell. That’s all from Te Hoiere for now but hopefully I’ll get round to blogging more regularly now that we have settled in. 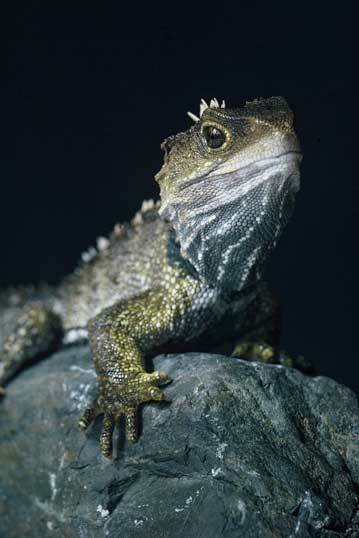 What New Zealand native species are you? Here’s a bit of fun for Conservation Week. 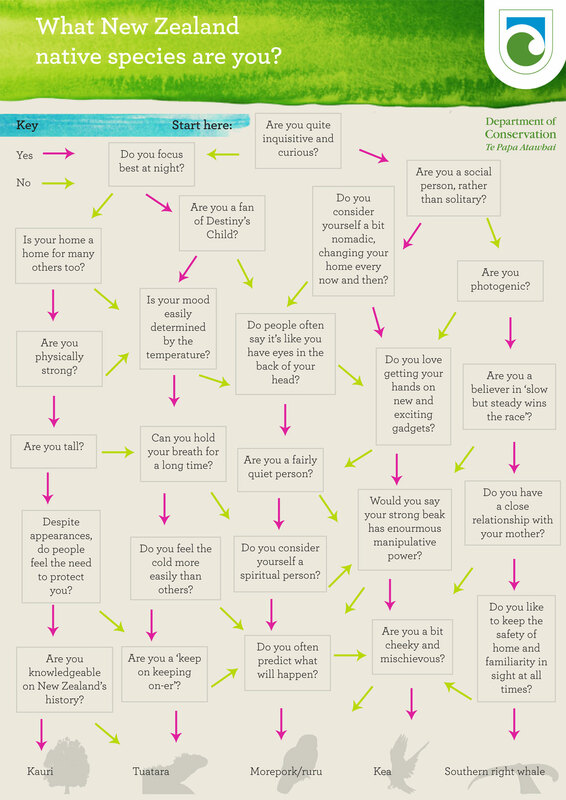 Use the chart to find out what native species you most closely match. Click on the picture to make it bigger (or download it as a PDF, 360K). You’re one of the world’s mightiest characters. You’re tall and strong and are respected by many. But with great power comes great responsibility, and you find that often you’re reassuring people that ‘My home is your home’ as you make room for another to settle in and take shelter. Because of your strength (if not physically then definitely your inner) you can persevere through tough times, and it is for this reason that people recognise your qualities and feel like they should protect you. With strong links to New Zealand culture, you take pride in your heritage and know a lot about what went on long before those around you arrived! Sometimes it’s as if you’re from another time, holding a wise and quiet knowledge of the past’s secrets. You’re easily affected by weather and temperature extremes—when it’s warmer you’re more inclined to potter in the garage, discuss our chances in the World Cup, and can find it hard to listen properly to those around you. When it’s cold, you feel the need to call up friends and discuss small details in depth, go shopping or curl up on the couch and watch some trashy TV. Like Beyonce, you’re a survivor and you don’t let predatory people or tough times bring you down. You’re a quiet sort, although you’re not afraid to speak up or call out when you’re in your element—which is any time after six in the evening. Definitely not a morning person, you focus best once the day winds down and the stars come out. With an unexplained connection to Maori traditions, you’ve almost got psychic traits. Often your musings on what could happen end up being right, and sometimes you could have eyes in the back of your head for all people under your watch know. But you are just looking out for them, somewhat of a guardian really. Always sticking your nose into other people’s business, you can’t help wanting to know what’s going on around you. You’re just so intelligent that boredom comes easily and as soon as anything new or out of the ordinary comes along, you’re there. You can talk your way into or out of any situation and have no trouble twisting people around your little finger. A burning need to pull apart and know how new gizmos work means accidental breakages are an accepted part of your life. But with the gift of the gab, you manage to charm everyone and you’re known for your cheek and mischievous ways. You work best on your own and enjoy spending time in your own company. In no rush, you move through life at your own pace—you know you’ll get there in the end. You tend to feel a bit panicky when you’re in unknown territory, so you like to know that home’s comforts are there at all times, and not straying too far from these brings you a firm sense of security. You spent a lot of time with your mother growing up, and as such you are (or will be) close with your own offspring. Despite not being overly social, your presence is inspiring and many find you quite breathtaking. For this reason you always seem to end up in front of the camera as people quickly try to snap a pose. I came out as a kea, which is quite accurate for me (as far as accuracy goes when comparing oneself to trees, reptiles, birds and whales!) 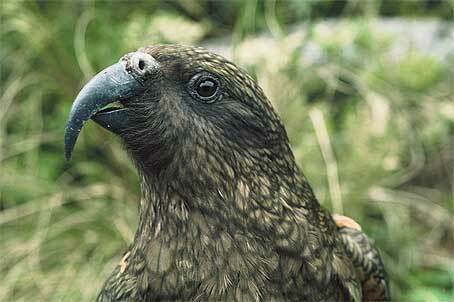 Just like kea I am fun loving, adore gadgets, and have a ‘beak’ that works quite hard for me. I am told that kea can cause conflict and be annoying though, and I’d rather pretend I don’t share those traits! 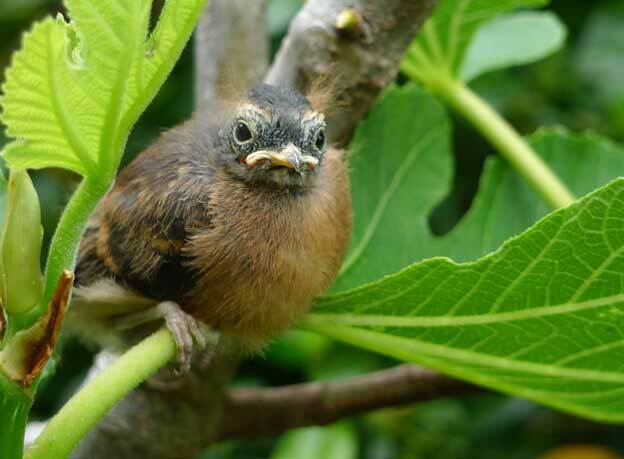 If I could be any native species I think I’d be a fantail/pīwakawaka. Even though they’re fairly common I always feel a thrill when I see one—and who would choose to belong to an endangered species anyway? Fantails are adaptable, energetic and cute. And, of course, no one gets annoyed with fantails. Anyway, make sure you leave a reply letting me know what you came out as, and whether you think it’s right. I’m particularly interested to see if other native species represent as strongly in our replies as kea. I have a suspicion that kea are more likely to take the time to do this kind of quiz (and then post a response). What do you think? 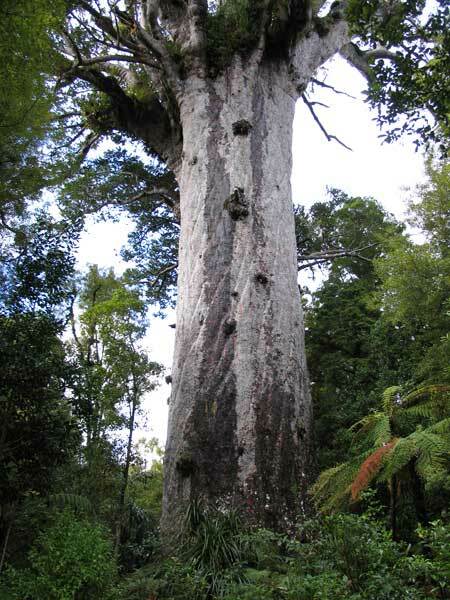 Can you kauri, tuatara, morepork/ruru and southern right whale personalities prove me wrong?